Myrtle Beach is a a beautiful city in South Carolina. Atlas Piers of Atlanta is proud to provide foundation repair services to the city. Myrtle Beach has a warm subtropical climate. Winters are mild and summers are hot and humid. Winter lows are in the thirties, while summer highs average in the upper eighties. Though the weather is worthy of making Myrtle Beach a huge tourist destination, it can actually cause some problems for buildings in the area. The professionals at Atlas Piers of Atlanta will take care of your foundation problems. For your commercial foundation repair in Myrtle Beach South Carolina needs, call our experts today! As temperatures vary, like they do in Myrtle Beach, soils can go through a cycle of expanding and compacting. The more this occurs, the weaker soils become. Because buildings rely on this soil for support, their strength is important. When this ground loses its original strength, they can begin to sink or settle. The structure above it can do just the same. There will be signs of this foundation settlement inside your business. Watch for cracks in your walls and floors. If you have a chimney, it might begin to lean. 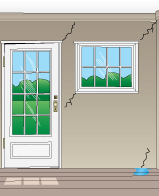 Doors and windows will become misaligned and be difficult to open and close. If you notice any of these things happening in your business, do not worry. Simply give us a call right away. If you put off repairs, the problem may worsen and become expensive to fix. With our foundation repair products, we will be able to fix your foundation problem in no time. Atlas Piers of Atlanta offers a variety of foundation repair solutions in the Myrtle Beach area. 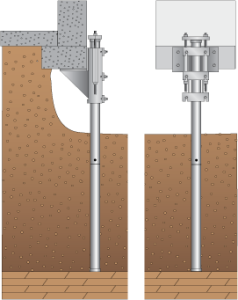 We provide underpinning, which can correct a settling foundation and prevent future sinking or cracking. We also install helical tiebacks, which are used to repair bowing and leaning walls and reinforce them. These tiebacks can protect your walls from the pressure of outside soil. Atlas also offers pressure grouting, a process where we can inject high concentration cement solution into your concrete, filling voids beneath it and correcting cracks. No matter what your foundation problem, we are simply your best option! With our professional and friendly staff, quality products, and unbeatable work ethic, you will be happy you called us. We are proud providers of foundation repair in Myrtle Beach South Carolina!